Cheeky marketing by Birmingham to London competitor Chiltern Railways, encouraging passengers to try out their Mainline service. Journey times that are only slightly longer than on Virgin, and maybe be end-to-end shorter if you’re closer to one of Chiltern’s stations. Seats which line up with the windows. It’s one of the few places in the UK where you can find some genuine competition on a city centre to city centre rail service. Chiltern have made massive improvements and real investments, i.e. spent their own cash, not claimed investment of public funds as their own, on the route and have worked hard to build a good relationship and understanding with their travelling public. The CEO of Passenger Focus recently wrote this blog article on his positive Chiltern Mainline experience, and wondered how they can continue to grow the service. I suggested ia a comment that recommendation, word-of-mouth, is very strong in helping the Chiltern cause, but even tongue-in-cheek marketing like this has it’s place. There’s one thing about the “wrapper ad” on the Metro which strikes me as bizarre. The words “Book now”. We’re talking about a less than 2 hour train journey between two cities in the same country, with departures every 30 minutes. Yet you want me to book ahead? The half-hourly service pattern is designed to be “turn up and go”, yet to be sure of getting the best (cheapest) fare for the time I want to travel I have to book in advance, and be nailed to a specific train, which I can’t miss, or I have to pay all over again (I can’t just pay an “upgrade”). If I arrive at the station early, I can’t take the train 30 minutes in front, even if it’s in the middle of the “off-peak” period in the middle of the day. I have to take the train I’d nominated. The UK rail system has become beholden to airline-style yield management systems to try and manage peak overcrowding and put bums on seats in the quieter off-peak, which has given the UK one of the most complex rail fare systems in Europe, where it’s often confusing for the passenger, who really just wants a ticket from A to B.
Doesn’t this kind of defeat the object of a frequent “turn up and go” service? 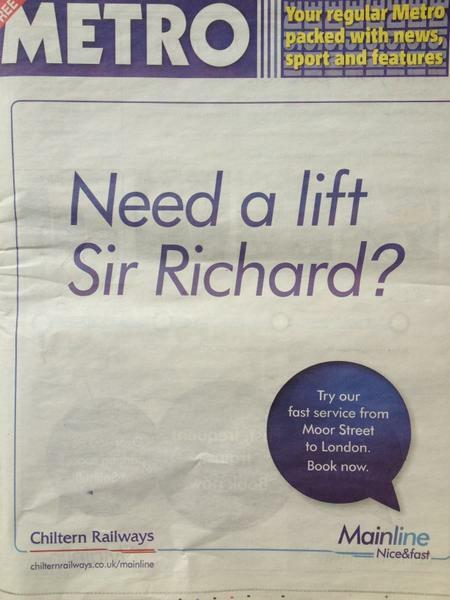 So, here’s a open suggestion to Chiltern which might give them a marketing advantage. No obligation, but a “thank you” might be nice if you try it out and it works. Instead of rigidly nailing a passenger to a specific train in off-peak periods, how about making such a ticket valid on the trains immediately before and after the nominated one? Rather than committing to a specific train, you commit to take a train within an agreed time window. I had thought about a complex system of “standby” linked to the yield management of the cheap seats, but that seems like more of an implementation challenge than saying “It’s okay, you can just get the next train”. I can’t take all the credit for the suggestion, because it’s based on something in Passenger Focus’ “Ticket to Ride” report – about exercising discretion for those on advance fares who have genuinely missed a train and are on the one half-an-hour later. I’m just considering if, for frequent “walk up” services, this could be taken to the next level? Next Next post: Is the new mapping app the “killer app” for iPhone 5?